On Earth, we think of methane as a clean-burning fossil fuel when confined to a tank, or alternately, a dangerous greenhouse gas when floating freely in the air. Indeed, researchers consider methane to be 30 times more potent than carbon dioxide in its warming potential; frighteningly, our planet has some 10,000 gigatons of methane currently trapped as methane hydrate in ice. This has prompted many scientists to sound the alarm bells over the potential for a cyclical out-of-control greenhouse effect that could release much of this trapped methane and rapidly warm Earth, dooming much life. Yet one planet’s poison is another planet’s ichor. A new study published in Astrophysical Journal suggests that the habitable zone — the region around a host star in which an orbiting planet could harbor liquid water, which suggests Earth-like life could thrive — may extend much further than previously thought once the potential presence of methane in an atmosphere is considered. The theory has many implications for the search for extraterrestrial life. “Methane expands the [Habitable Zone] outwards for host stars with effective temperatures above about 4500° Kelvin,” the paper’s co-authors, Ramses M. Ramirez and Lisa Kaltenegger, note. For context, the sun’s surface temperature is around 5,800° Kelvin, and the habitable zone in our solar system starts between Venus and Earth and extends just beyond Mars; evidently, the presence of a methane-rich atmosphere could theoretically extend that habitable zone a bit further in our solar system. Specifically, the authors say methane concentrations that replace 10 percent of carbon dioxide composition can make the habitable zone wider by 20 percent. Interestingly, the same is not true for stars cooler than that. 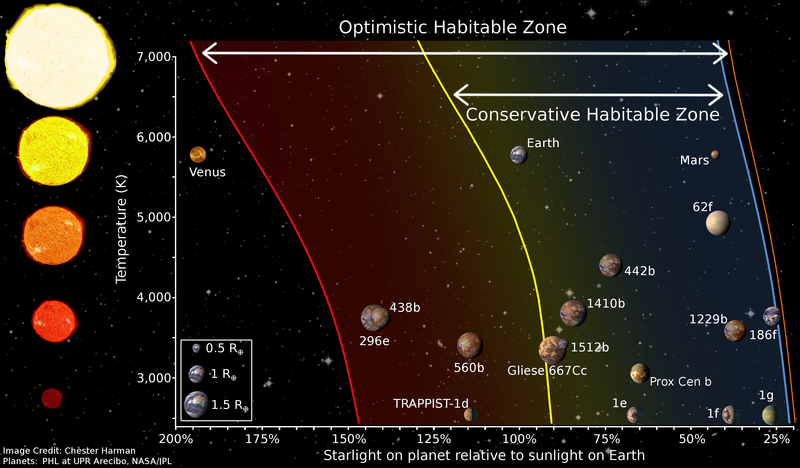 For the coolest stars in the scientist's model, which glowed at around 2600 degrees Kelvin, the habitable zone actually shrinks 20 percent given a comparable methane composition in a planet’s atmosphere. In our own solar system, the warming effect of greenhouse gases can be seen most dramatically in Venus. While Venus may have been a much cooler world at one point, an out-of-control greenhouse effect turned it into a dense, choking hellscape. Venus’s atmosphere is almost entirely carbon dioxide, with clouds of sulphuric acid that rain down acid on its surface, where the temperature is a lead-melting 800-plus degrees Fahrenheit. One intriguing prospect of the paper is the possibility that some exoplanets previously dismissed as lifeless may be reconsidered as possibly habitable, and vice-versa. Wikimedia actually has an excellent diagram showing some exoplanets that we have discovered that are in or near their stars’ respective habitable zones; I’ve reproduced it below, if you’re curious. Specifically, take a look at Kepler 186f, which appears towards the outer edge of its star’s habitable zone and is one of few Earth-size planets in a habitable zone. If Kepler 186f has some methane in its atmosphere, its habitability potential could change dramatically; although, as its host star is cooler than 4500 degrees Kelvin, a methane-rich Kepler 186f may not be habitable at all. Is there a planet nine? Is there a ninth planet in our solar system? Dr. Jackie Faherty is here to discuss the possible existence of this so-called "super-Earth" and what it would mean for our solar system.